Whether you have been charged with a speeding ticket, a misdemeanor or a serious felony, our attorneys will aggressively protect your legal rights and defend you against any accusation. Criminal charges present complex legal issues and can lead to serious disruptions of your personal and professional life. Let our dedicated attorneys and staff be your advocates and guides at this difficult time. 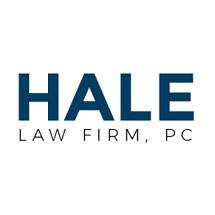 At Hale Law Firm, PC, our clients receive a high level of personalized, professional service that extends beyond our in-court representation. We understand that criminal charges affect different clients in different ways, and we tailor our legal advice and representation to your individual situation. We keep our clients well-informed about their cases through regular correspondence, and assist you in handling any unforeseen consequences of your case. We also offer reasonable payment plans to accommodate your needs. Please contact our office today for assistance with your criminal defense case. We appreciate the opportunity to represent you.